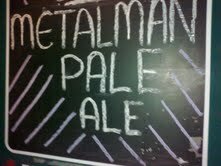 Deveneys of Dundrum: Metalman Pale Ale... launched. The Bull and Castle; Beer Hall was heaving last night. 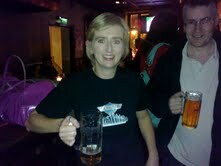 The newest editions to the Irish brewing scene - Grainne and Tim; were showcasing their 'baby'- ''Metalman Pale Ale. 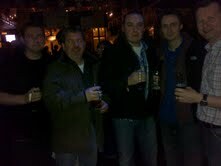 Bloggers; brewers; beer enthusiasts; retailers and wholesalers all turned out for the gig. I am a massive fan of The Bull and Castle and I also have a serious soft spot for Irish craft beers so there was no question about my attendance. I am massively impressed with this Pale Ale. I had done a little bit of internet research on other Metalman reviews and some said it was very similar to other Irish Pales on the market. I do admit that when drinking beer I really only consume bottle format but I can confirm that this is like no other Irish Pale I have tried. 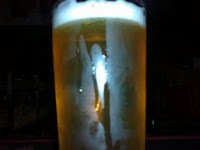 It's a lovely golden nectar colour with a thin white head. The palate is really clean with very strong flavours of grapefruit and fresh lemon peel and it finishes with a slightly metallic flavour It has a fine effervescence; not overly carbonated. Really refreshing and tastes exactly like an ideal summer beer- garden brew. Congratulations to Grainne and Tim. 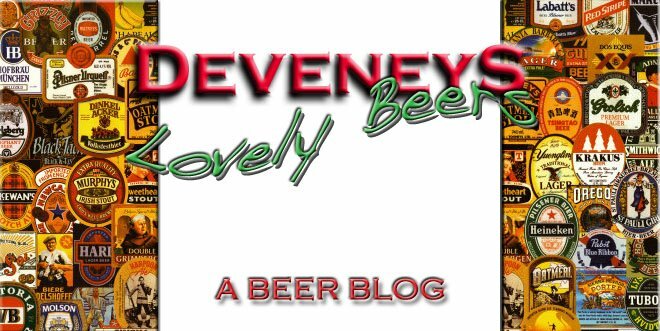 Another great Irish beer and living the dream - Best of Luck! Against The Grain; Camden Street. Bottling with any luck this year! Labels: Metalman Pale Ale... Launched. Apologies; not yet available in Against the Grain. Coming soon.